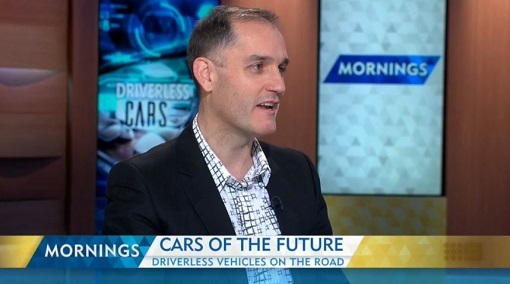 Yesterday morning I was interviewed on Channel 9 Mornings about driverless cars. You can view the segment by clicking on the image below. * Safety. Humans are highly fallible, as self-driving cars improve we can be confident they will in the (vast) majority of cases be safer than human drivers. * Vehicle efficiency. Driverless cars can be continually operational and do not need to be tied to a single driver, meaning we can have far fewer vehicles. * Fuel and road efficiency. Self-driving cars can be designed to be far more energy-efficient, and once there is a sufficient proportion of self-driving cars on the road, they can interact with each other to create optimal road efficiency, reducing traffic jams and travel time. * Time and attention. Across major cities globally, average daily commute time is an hour or longer. This adds up to two weeks of waking time a year that is available for work, entertainment, or socializing. * No drunk driving. Depending on your perspective, this creates far safer roads, or more opportunities to over-indulge. * Free up parking spaces. Self-driving cars can drop people off and trundle off to somewhere convenient. The massive amount of parking in prime destinations can be freed up for better uses. Of course there is not only upside. Beyond the technological, regulatory, and financial issues that need to be addressed to get driverless cars common on the roads, there will be a real impact on jobs as drivers transition to other work, as well as the reality that technology is vulnerable to compromise. There is a very high degree of uncertainty on the pace of adoption of driverless cars, as it is driven by regulatory change. While four states in the US, UK and France are allowing driverless cars on the road for testing, suggesting that other countries could follow suit and the technology rapidly become widespread, that could easily change. However the social and environmental benefits are compelling. Let’s make it happen.